Official Royal Navy photograph of HMS Prince of Wales (Pennant Number 53) shortly after her completion and during her shakedown cruise on April 20, 1941. Note two sailors standing near the bow and Supermarine Walrus aircraft being recovered after a test flight. HMS Prince of Wales mounted ten 14-inch (360-millimeter) Mark VII naval guns in two quadruple turrets and one superfiring double turret. Laid down in 1937, she was launched on May 3, 1939 and commissioned on January 19, 1941. She was still being worked on during the Battle of the Denmark Straight on May 24, 1941, when she was hit in the second smokestack, causing a fire. HMS Hood blew up and sank during the battle. Prince of Wales's quadruple turret failed to train and some of her guns jammed. 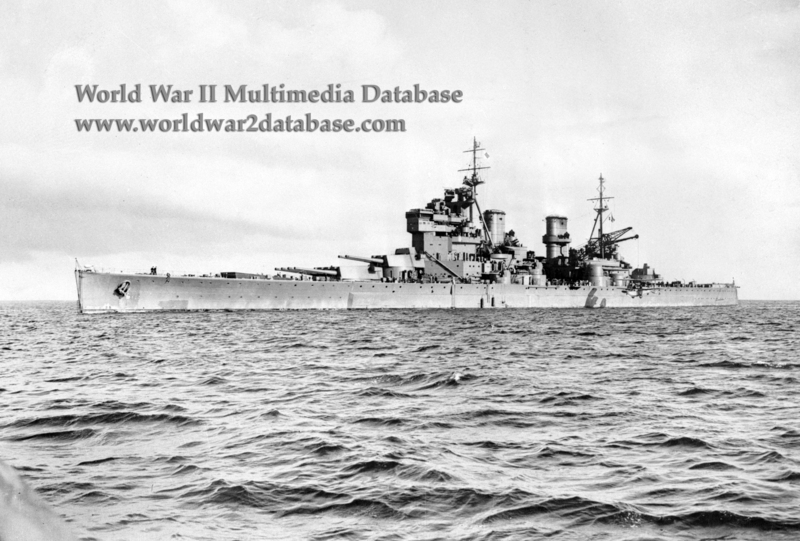 Prince of Wales withdrew under a smokescreen and exchanged fire again the next day before withdrawing because of lack of fuel; Bismarck was sunk by combined gunfire of HMS King George V, Prince of Wales's sister ship, and HMS Rodney on May 27. She carried United Kingdom Prime Minister Winston Churchill (November 30, 1874-January 24, 1965) to meet with United States President Franklin D. Roosevelt (January 30, 1882-April 12, 1945) to the Atlantic Conference in Argentia, Newfoundland, on August 10-12, 1941. In his memoirs, Churchill said, "On Sunday Morning, August 10, Mr. Roosevelt came aboard H.M.S. Prince of Wales and, with all his staff officers and several hundred representatives of all ranks of the United States Navy and Marines, attended divine service on the quarterdeck. this service was felt by all of us to be a deeply moving expression of the unity of faith of our two peoples…It was a great hour to live. Nearly half those who sang were soon to die." On October 25, 1941, Prince of Wales was ordered to join Force Z, consisting of her and the battlecruiser HMS Repulse and four destroyers. Force Z was deprived of air cover when the new aircraft carrier HMS Indomitable was grounded in Jamaica during shakedown and needed repair. Churchill sent Force Z to reinforce Singapore and to impress the Japanese into not invading Malaya. Undeterred, the Japanese sent the Genzan and Mihoro Air Groups from Saigon, flying Mistubishi G3M and G4M medium torpedo bombers to attack Force Z on December 10, 1941, two days after they launched an invasion of Malaya. Prince of Wales, hit by four torpedoes and a bomb, slowly capsized and sank, killing 327 British officers and crew, including Admiral Thomas "Tom Thumb" S. V. Phillips (February 19, 1888-December 10, 1941) and Captain John C. Leach (September 1, 1894-December 10, 1941) who drowned when the ship rolled over. In 2002 Prince of Wales's bell was removed and is now on display at the Merseyside Maritime Museum.